In Crazy Penguin Catapult, your kamikaze penguin army must take back its ice floes from the invading polar bear horde. If you grew up with side scrolling video games, or if you have a penchant for casual games, the crazy penguin army will provide hours of fun and challenging game play. Stop the invading polar bear army using your loyal penguins. Starting from a subterranean base you must launch your determined penguins into the sky via catapult where they can commence their attack on a maze of caves that the bears have occupied. You must dive-bomb, bounce and slide your way to victory against your furry targets. Your launch timing must be perfect or your brave penguins will simply get splattered against the cave’s ceiling and walls and you will have fewer attacking penguins to successfully beat that level. Once your penguin attack force is airborne you attack the bears’ icy stronghold from above. Tapping the screen causes your penguins to streak beak-first kamikaze-style towards the bears. As they bowl into bears, ice and other obstacles they bounce, slide and ricochet in an attempt to clear the level of its targets. The more bears that you wipe off the ice the more stars you gain as you continue your quest. Those stars add up along the way for bonus penguins or special attributes like ice melting penguins and penguins that bounce around like a four year old on a sugar rush. 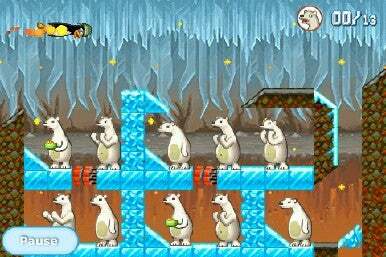 Crazy Penguin Catapult has 30 challenging levels and offers you the ability to perfect your bear attacks and bonus rounds as you seek to reclaim chilly dominance over the icy landscape. For those looking for some great fun and hours of challenges Crazy Penguin Catapult is well worth the $3 for either your IPhone or iPod Touch.